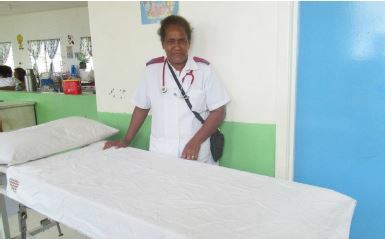 Honiara, Solomon Islands – this week, the National Referral Hospital (NRH) has receive more medical equipment donated by NZ based charity trust, Take My Hand Charity. The chief Executive Officer [CEO] Dr Steve Aumanu said, the National Referral hospital is very pleased with the continuing support of Take my hand NZ and its supporters especially Mr Short for continuous assistance to the National Referral Hospital. 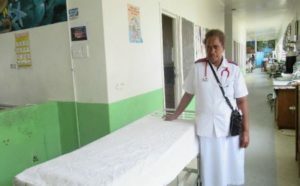 ‘’There is an increasing number of admission in the hospital and the quality of service given to patients is very significant in terms of infection control hygienic practices and mobility of patients, therefore the donated items such as hand gloves, gowns, linens, wheel chairs, crutches, wheeled walking frames, walking sticks and hospital beds are our great need at the moment.’’ Said Dr Aumanu. Some of the items that came in the container were distributed to women’s group in Auki, Malaita province. We would like to especially thank Mr Jonny SY, Solomon Islands Forestry Association and Solomon Islands Ports Authority Management [SIPA] for the waiving of port fees and transportation to the medical store, NRH would not have the medical equipment at hand’’, Medical superintendent office [NRH] Dr Rooney Jagilly said. ‘’Take My hand’’ is a charitable organisation based in New Zealand that has been supporting and donating medical equipment’s to National Referral Hospital and to other provincial Hospitals and organisation. ‘’We look forward to continued association with Take my hands.’’ Dr Rooney said.